Lan Jianxue told the Communist Party-run Global Times newspaper, “If there is an ‘out-of-box solution,’ it is highly likely a breakthrough over the eastern part of the border, which contains the most controversial area between China and India”. With Indian and Chinese officials in recent weeks raising expectations of significant progress on the long-running boundary dispute ahead of Prime Minister Narendra Modi’s expected May visit to China, a Chinese strategic expert on Tuesday delivered a sharp reminder of the obstacles still looming before any progress on the issue, telling India that any “breakthrough” would be impossible without concessions on Arunachal Pradesh. Responding to comments made by External Affairs Minister Sushma Swaraj to reporters during her February 1-2 visit to Beijing suggesting that Modi and President Xi Jinping, as two strong leaders, may enable an “out of the box” approach to solving the border dispute, strategic affairs expert Lan Jianxue told the Communist Party-run Global Times newspaper, “If there is an ‘out-of-box solution,’ it is highly likely a breakthrough over the eastern part of the border, which contains the most controversial area between China and India”. His comments reiterate the Chinese view that a boundary settlement will require adjustments in all sectors – western, middle and eastern. India sees China as occupying at least 38,000 sq km in the western sector in the Aksai Chin region, and will demand settlement on that front. 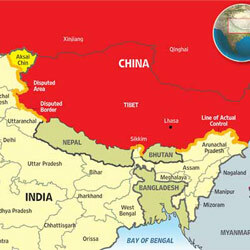 China has, since the late 1980s, voiced claims to 90,000 sq km in the eastern sector in Arunachal Pradesh. Lan cautioned that “it might be too soon to anticipate that this solution will be reached in May during Indian Prime Minister Narendra Modi’s first visit to China since assuming office”. He said the Modi government had shown “a tougher attitude” by beefing up border patrols and pushing long overdue moves to improve infrastructure. While he expressed optimism that Swaraj’s comments showed that India was “making efforts in showing flexibility and creating a favourable atmosphere on resolving the issue”, he added: “However, to this day, the Indian government has not given us a reply or any signal of goodwill for adjustment over this issue. In the light of this, the ball is in India’s court to adopt a more proactive approach,” suggesting that an adjustment in the eastern sector was China’s starting demand. At the same time, China has shown no inclination towards even discussing India’s claims over Aksai Chin, even officially claiming that “there was no dispute” in the western sector and the boundary disputed was only 2,000 km long – not even recognising the more than 1,500 km disputed in the western sector. Lan claimed that China “used to offer a ‘package proposal’ for settling the issue, which requires each side to make a compromise, yet it was turned down by India.” It was unclear if he was referring to former leader Deng Xiaoping’s reported offer of a “swap” settlement along the status quo, that would see both sides more or less holding on to their claims with minor adjustments – China keeping Aksai Chin and giving up claims in the east.